Dr. Daniel Lauer has upgraded his Palm Beach practice’s website to a new, responsive format for a fresh look and easy navigation. 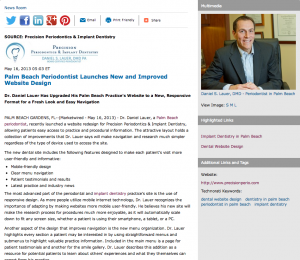 Palm Beach Gardens, FL – Dr. Daniel Lauer, a Palm Beach periodontist, recently launched a website redesign for Precision Periodontics & Implant Dentistry, allowing patients easy access to practice and procedural information. The attractive layout holds a collection of improvements that Dr. Lauer says will make navigation and research much simpler regardless of the type of device used to access the site. The most advanced part of the periodontal and implant dentistry practice’s site is the use of responsive design. As more people utilize mobile internet technology, Dr. Lauer recognizes the importance of adapting by making websites more mobile user-friendly. He believes his new site will make the research process for procedures much more enjoyable, as it will automatically scale down to fit any screen size, whether a patient is using their smartphone, a tablet, or a PC. Another aspect of the design that improves navigation is the new menu organization. Dr. Lauer highlights every section a patient may be interested in by using straightforward menus and submenus to highlight valuable practice information. Included in the main menu is a page for patient testimonials and another for the smile gallery. Dr. Lauer describes this addition as a resource for potential patients to learn about others’ experiences and what they themselves can expect from his practice. Patients can also learn about current industry trends and methods on Dr. Lauer’s new blog. The purpose of which is to detail the latest in periodontal news, including what is new with his Palm Beach dentistry practice. By doing so, Dr. Lauer is able to better connect with his patients and provide valuable tips and updates on the industry. Precision Periodontics & Implant Dentistry’s new website was developed by Rosemont Media, a San Diego-based dental website design firm. Dr. Lauer is proud to offer patients easier access to medical information through his improved site. He explains how the flexible design and up-to-date information will offer a better understanding of what his practice offers as well as what patients can expect in their procedures. Dr. Daniel Lauer is a board-certified periodontist and dental implantologist. He graduated with honors from the University of Florida – College of Dentistry and was a resident at New York University for periodontics and implantology. 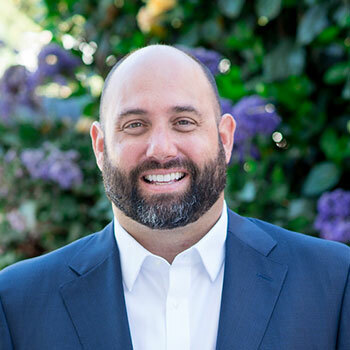 Dr. Lauer is currently a member of distinguished dental organizations such as the American Board of Periodontology, American Academy of Periodontology, Academy of Osseointegration and more. He and his team of dental professionals strive to offer a superior periodontal service while utilizing the most up-to-date techniques and equipment. Dr. Lauer is available for interview upon request.